Sorry for being absent from Xanga for over a week. We returned from the United States with my sister and brother-in-law in tow, and have been showing them around Bangkok, leaving little time for blogging. With that said, let me pick up where we left off in Hawai’i. For the final segment on food in Maui, we visit a lavender farm, a goat dairy, and eat some fantastic fish tacos. One of the interesting things about Maui is that it is agriculturally more diverse than you initially expect. 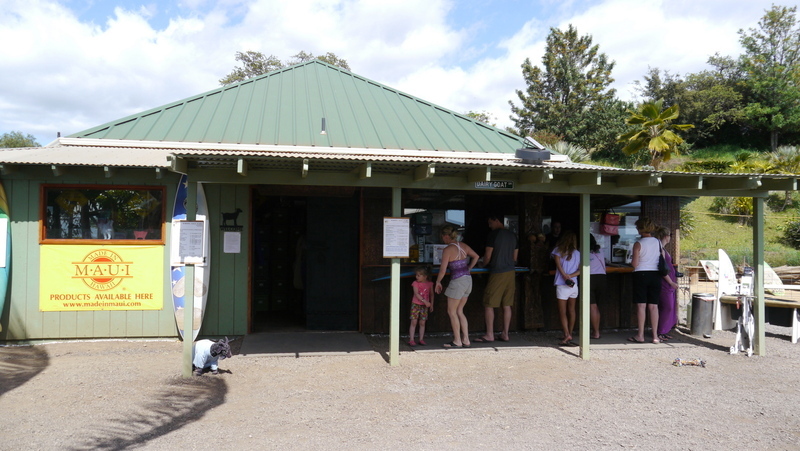 While there are wide swaths of land dedicated to sugar cane and other tropical produce, as you ascend the slopes of Haleakala (the volcano that forms the eastern 75% of Maui), you pass through a more temperate zone. The combination of rich soil, moisture-laden air, and the filtered tropical sun provides a fertile growing environment for a wide variety of produce. Ali’i Kula Lavender Farm is a great example of this. 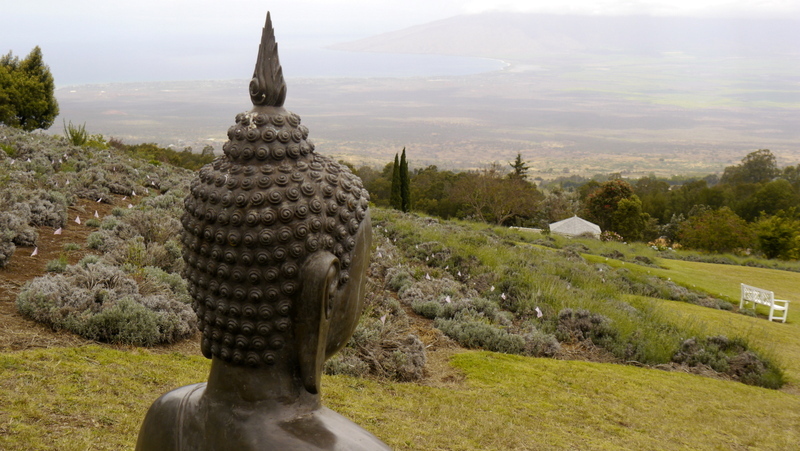 Situated 4,000 feet above the ocean in the town of Kula, the Ali’i farm stretches over 13 sloping acres. Different varieties of lavender are cultivated and the grounds are largely open for self-guided walking tours. In the early afternoon, the breeze was pleasantly warm but we were protected by a thick layer of clouds that reminded me of the fog of my native San Francisco, but without the need for multiple layers of clothing. 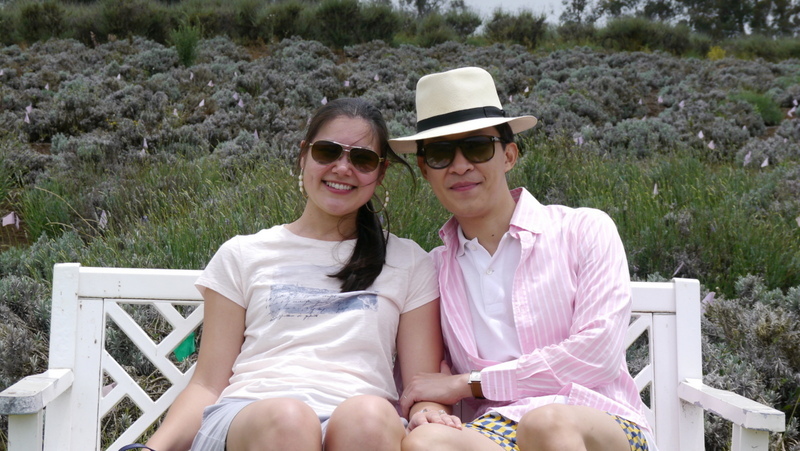 Here, Sugi and Tawn pose amidst a field of lavender on the upper edge of the farm. The farm offers settings for private events including weddings. While the steep slopes might prove challenging for guests with limited mobility, the views (and fragrance!) would be unforgettable and worth the effort. Close up of one variety of lavender. 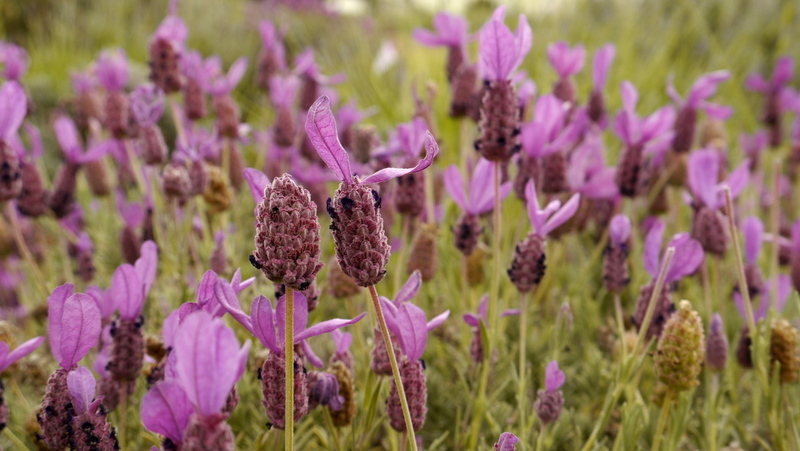 The air really is perfumed with a subtle, but pleasant aroma from the acres of lavender. 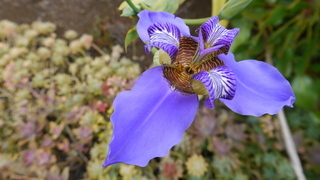 In addition to the lavender, the farm has extensive gardens with many different plants and beautiful flowers. Many of the plants were familiar to me from growing up in the San Francisco Bay Area, which has a similar climate. 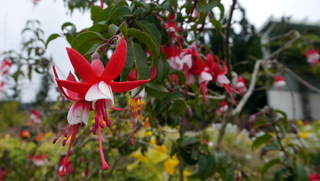 I was excited to see the fuchsia (on the right) because my father used to grow these in our back yard. No trip to the farm is complete without a stop at the gift shop for a snack. 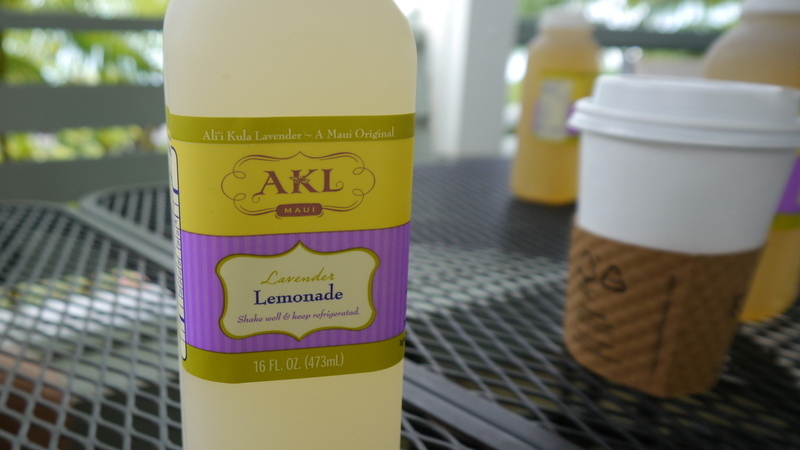 Beverages include lavender lemonade and tea. The highlight is the lavender scones served with passion fruit and lavender jelly. A few years ago, I purchased some food grade lavender but rarely used it. Tasting these scones, I was sorely tempted to buy some more and make it a point to cook more frequently with this beautiful flavor. Sitting on the shady balcony outside the gift shop, we were visited by a flock of small birds who waited not so patiently for scone crumbs. 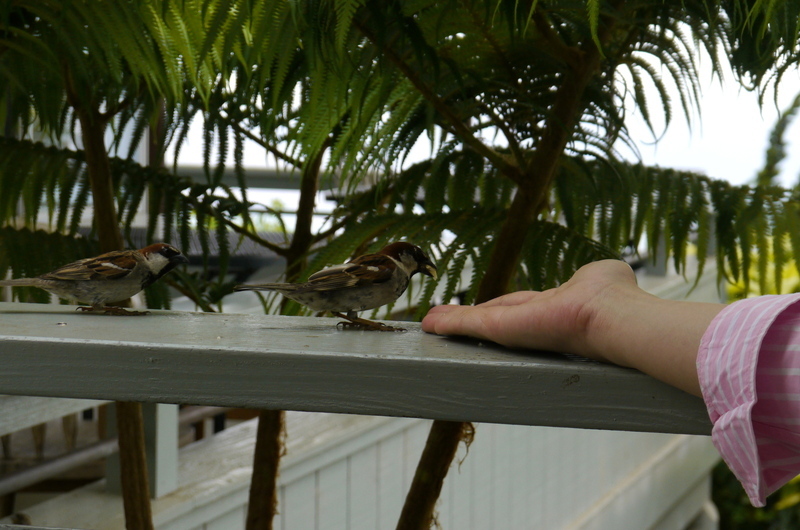 Tawn decided to share his crumbs with them and they gingerly approached and pecked them from his hand. 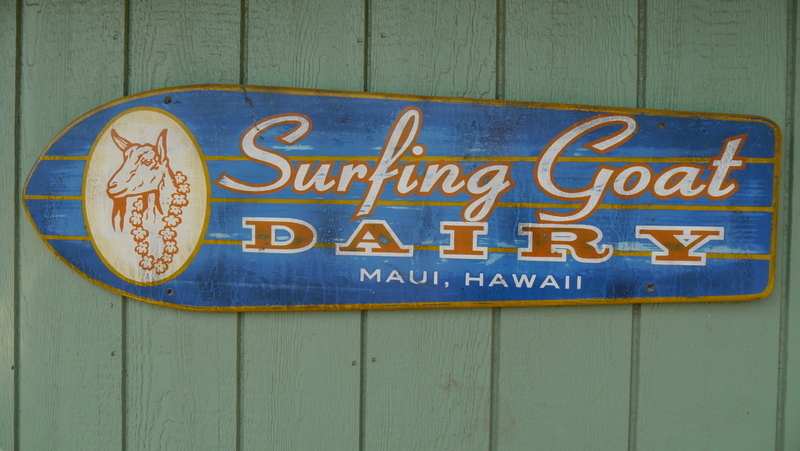 Just down the hill from the lavender farm is the Surfing Goat Dairy, another example of the agricultural variety found on Maui. 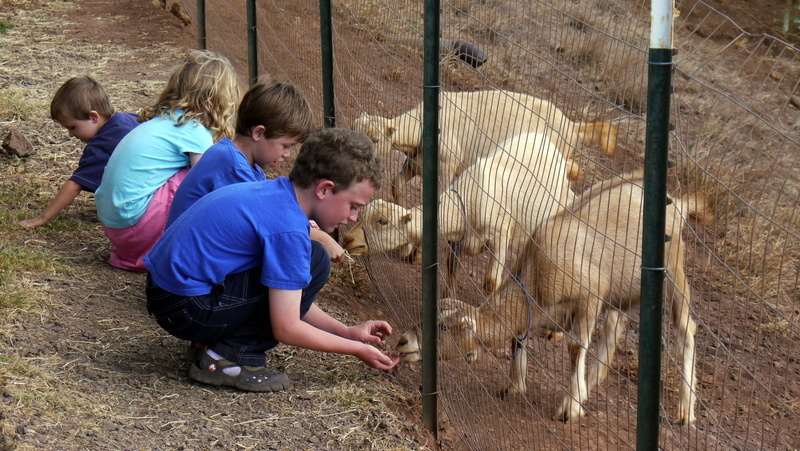 A working farm that produces more than two dozen varieties of goat cheese that are used at restaurants across the island, Surfing Goat Dairy proudly claims to make da’ feta mo’ betta! 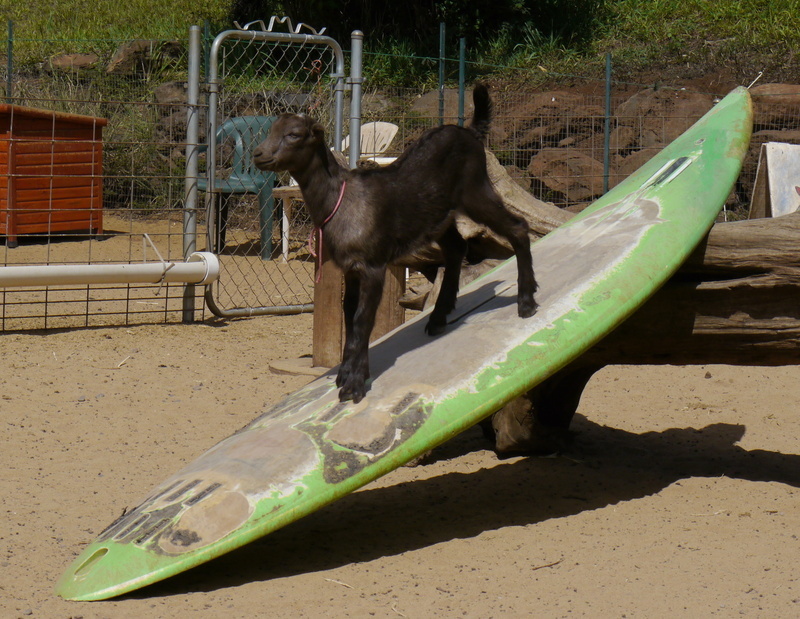 One of the younger goats playing on a surf board. The dairy offers tours and there is a small gift shop that sells a variety of their products. 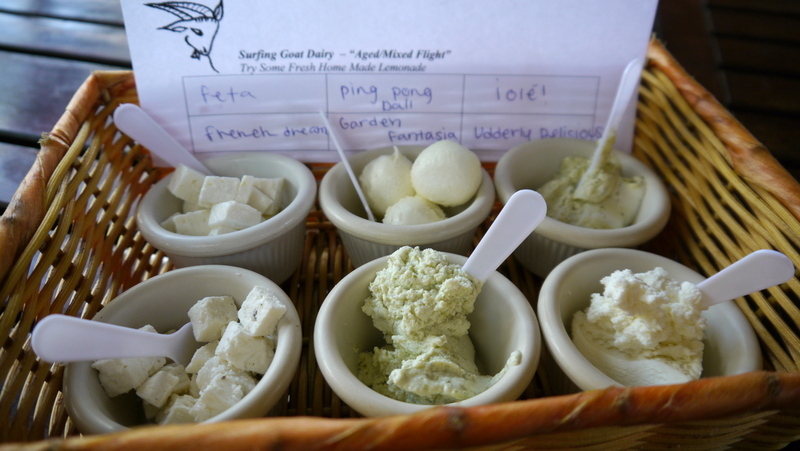 Recommended are the cheese tasting flights, which feature both fresh and aged cheeses. We sampled six cheeses, a mixture of fresh and aged. From the back left, clockwise: fresh feta, “Ping Pong Balls” (drained chevre, rolled into balls and marinated in garlic olive oil), Ole! (chevre with jalepenos, lime juice, artichokes, and cilantro), Udderly Delicious (plain, salted chevre), Garden Fantasia (chevre with fresh garden herbs), and French Dream (an aged cheese with herbs de Provence). Lots of fantastic cheese here, many of which have won national awards. A pleasant, shaded seating area was populated with a friendly farm dog and cat, both of which came over looking for some attention. Despite being outside, both animals had exceptionally soft, well groomed coats. Perhaps the result of drinking plenty of goat milk? 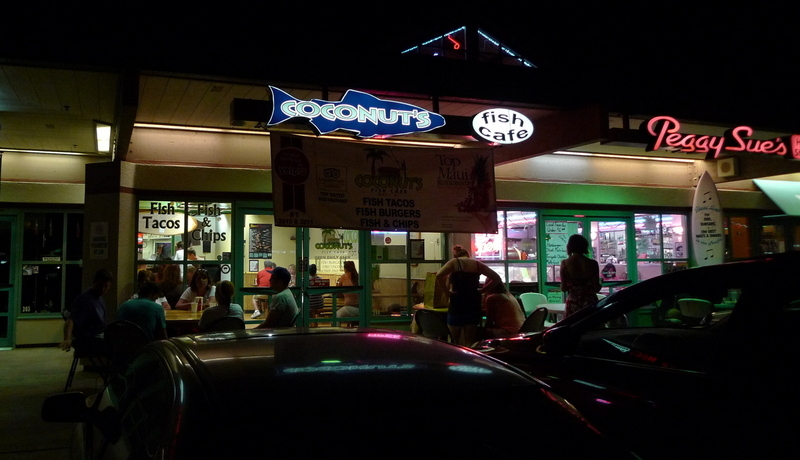 The final entry about Maui food concludes with a stop at Coconut’s Fish Cafe in Kihei. This restaurant, which is in a strip mall, looks like nothing to write home about but surprises you with tremendous quality. The must-eat item is fish tacos, which are prepared from fresh, locally-caught fish. The owner, Mike Phillips, who is in the shop most evenings, supervises operations and comes out to chat with customers. He took this picture for us. He explained that they are just setting up franchises on the west cost of the mainland, with the initial store to be in Santa Cruz. 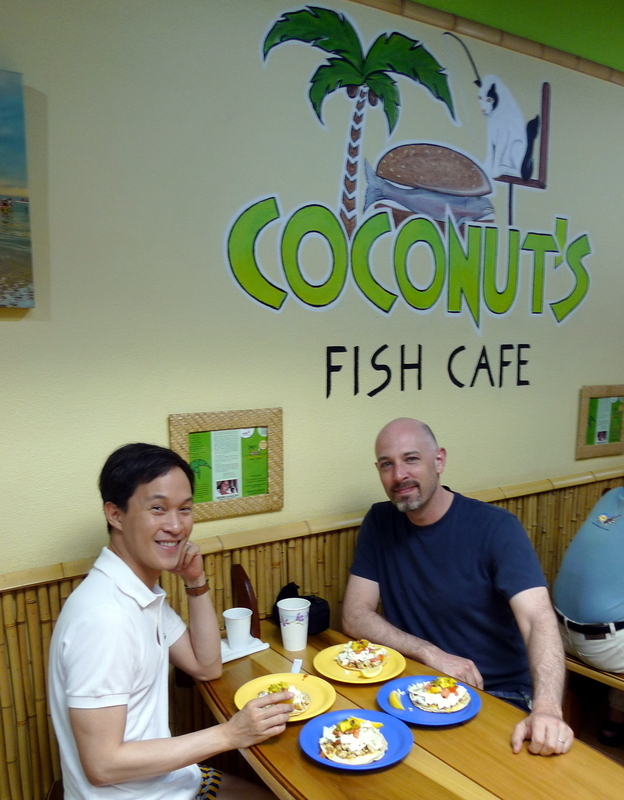 If a Coconut’s Fish Cafe opens near you, please make sure you try it. As Mike explained, the only advertising they do is customer word-of-mouth. So from my mouth to your ear: word. The beautiful fish taco, made with fresh mahi mahi, crunchy cabbage slaw, and a sweet and tangy mango salsa. This taco was so good that I would seriously consider stopping in Maui next time I’m flying back to the mainland US, just to eat here. My only quibble is that the toppings are cut in very large chunks, making them a bit hard to eat. Smaller bits would ensure you get a little bit of everything in each bite, but that’s a tiny complaint. There you have it, the conclusion of my Maui Food Madness entries. I hope you enjoyed them! This entry was posted in Uncategorized and tagged Alii, cafe, Cheese, Chevre, Coconut, Coconut's, Dairy, Dining, Farm, Fish, food, Goat, Hawaii, Kula, Lavender, Maui, Restaurant, Scone, Surfing, Taco by christao408. Bookmark the permalink. Would so like to go back to Maui and try all the food you have shared! Fish tacos and the lavender scones look heavenly. Looks like it was a wonderful trip! Any lavender ice cream? The photos turned out fabulous! I would interested in the cheeses. The last dish looked excellent in presentation and just as yummy I am sure. Thanks for the tour. 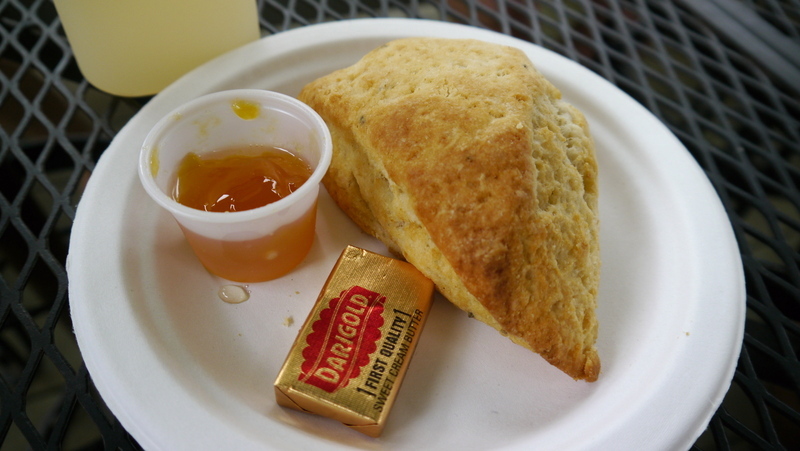 I’ve seen lavender tea but I’m not a tea drinker… The scone looked tempting. Too much fun! Hope your guests had a wonderful visit! Amazing. I must read this again when sober. @CurryPuffy – Sadly, no lavender ice cream, even though that would seem an obvious item to include, right? @awoolham – I have to say, the food on Maui was much better than the food we had last year on Kauai. Maybe because we had locals to suggest things, or maybe just because Maui is larger and produces a wider variety of its own food. @I_love_Burma – The fact that they have a surfboard for the kids to play on is very funny. Good use for a retired board, I guess. Hopefully, the kids don’t chew the fiberglass! @Inciteful – It may not be as enticing when you are sober…@murisopsis – Guests are still here for another week but I felt like I needed to get my behind in gear and blog again. (And respond to some of your many entries! )@Fatcat723 – You are most welcome. Glad you enjoyed. @oxyGENE_08 – Thank you very much. as always you make me soooooo hungry a surfing goat how novel do they actually take him out on the water? @iskrak – Dog foot cushion = lap of luxury. @grannykaren – My suspicion is that he doesn’t catch any actual waves. The surfboard is just one of many toys in the area where the kids live. @vsan79 – Yes, it sure was. Now that is a fish taco. The local place here frieds everything to hell, throws it in a greek pita with some tomatos and lettuce and calls it a fish taco (after adding tartar sauce). They’re a disgrace!What exactly is lavender jelly? Is it, a natural product of the plant, honey from the lavender plant, or simply lavender flavoured jelly? @paperblanks – jelly made with lavender extract… Maybe boil it in sugar syrup to get the flavor out? I really appreciate the effort you put into your blogs. I love the picture and the writing. You had a bit of everything here. The flowers are nice and I can almost smell the lavender. The cheese tray waiting to be sampled. The soft fur of the dog and the cat. The awful pun (kid feeding kid). 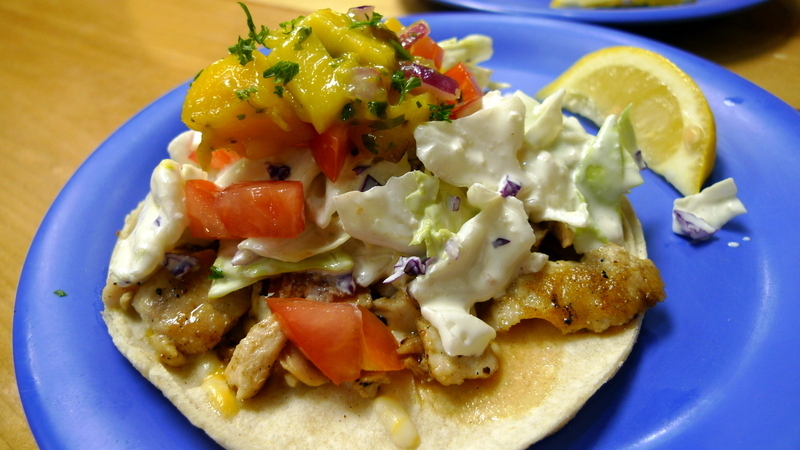 The wonderful bit about the Coconut Fish cafe and the yummy picture of the fish taco. @ElusiveWords – Thank you Matt. Your words and appreciation mean a great deal to me.